The I-10 Automall Ford and Toyota service departments offer a wide selection of auto maintenance and car repair services near Palm Springs, CA. Bring your car, truck or SUV in for an Oil Change, Brake Inspection, New Tires, Battery Replacement or any of our other auto services. Our auto service centers near Palm Springs are ready for everything from minor Ford and Toyota maintenance work and tune-ups to more extensive auto repair. 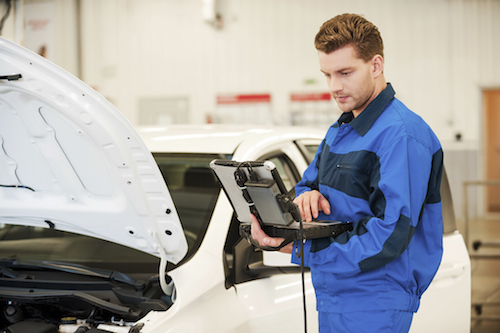 Our Ford and Toyota service technicians will diagnose and repair problem areas quickly and efficiently. I-10 Autmall technicians use genuine Toyota and Ford Motorcraft Parts to preserve the longevity of your vehicle and keep it running properly. Ford and Toyota Service Specials and coupons are available for extra savings on auto maintenance work and replacement parts. See our current list of Auto Service Specials & Coupons for these discounts. Relax in our comfortable service lounge while we work on your vehicle. Or stroll through our showrooms of beautiful new Ford and Toyota vehicles. The I-10 Automall of dealerships is a one stop shop for new vehicles, used cars, service and repair. Please contact us with any questions.